Next year marks 10 years for me working professionally in the graphic design field. I have had the opportunity to work for a web design firm, a printing company, and now an international wedding accessory company. Being able to work as a member of a corporate design firm as well as an in-house designer has allowed me to experience design from both sides of the fence, so to speak. Each insight has shaped my design experience. Most fresh faced graphic designers feel like they are failing if they get stuck on a project. Talking about their project, asking for input from other team members, is the beauty of a creative team. It will force you to think in a different direction or see things from a different perspective. Even if working as an independent designer there are plenty of excellent resources online. You can post your designs online for other creatives to give feedback in real-time. Collaboration is a designer's best friend. The more members you have a part of your creative team the better. The more minds, the more ideas. The more talents, the more specialties to draw on. The better end product. There are times when I miss the freedom of design school, the experimentation of style, the expression, the creatives I was able to hang around. In school it was all about developing your portfolio of work, which in most cases was designing for yourself. You were your own client promoting yourself to land your first job. Landing that first design job quickly introduced a learning curve. The challenge - translating the tools from school into practical application. Working professionally in design is hard work. In the real world it is about your client wants, quoting your time, meeting deadlines, and still carving a creative identity for yourself. Early on in my career I designed a double sided full color brochure for a local carpet cleaning company. The client was extremely happy with the design, the proof was signed, the ink plates prepared ready to go on the press. The perfect job quickly became a nightmare. The small detail of choosing a dark chocolate brown PMS spot color would have avoided the disaster on press as well as an angry client with 20,000 mismatched streaked brochures. Check your ink coverage. If you are designing in CMYK make sure you do not have large areas of color that are maxing out (70%+) on ink on each of the four plates. The press can not handle it, especially in the browns or greys. It will become a streaky mess. Trust me. There was a point in my career where I thought I knew everything I needed about design. Impossible. Graphic design is a constantly changing field. The new technologies in web and print, design trends, software, are never ending. Staying on top and being informed will help you in your career. But you will never know it all. Thinking you know it all will not get you anywhere. It will actually keep you from progressing. In my early design jobs my body text was 12 points or even larger. Looking back this was enormous. 12 point is the default sizing of all the design software programs but there is a reason why you can change the size. For large areas of body text reduce your font size to 11 points or even 10. It will be easier to read and will give you more room to play with the leading. Good body text should seem like it is natural to read. If you notice the body type before the content that is a bad thing. My first graphic design job was not glamourous. As the business downsized I ended up working in a cubicle designing in a printshop. But it was worth sticking it out. I was able to gain loads of experience with web design and hands on experience in a print environment. I was able to work directly with corporate clients for both web and print projects as well as learning the tricks of the trade in the prepress area of printing. All invaluable to my current position. Reducing or starting a design in black and white reduces it to the basic form. This allows you to focus and not be distracted by color. This is particularly important in logo design. Logos need to be reduced to the basic black and white to transferred into embroidery, engraving, or stamping applications. Ideas have a mind of their own and have a funny way of showing their face. Even though your job may have a 9-5 schedule, the creative's brain is always working. Inspiration is in the supermarket, when you are taking a shower, traveling, talking to a friend, watching TV. By allowing your brain to work without a schedule you will see ideas all the time. As adults we sometimes lose the spontaneity in our work. Hang out with kids. See how they colour outside of the lines. See how they view the world. Hold on to that with your own work. It will be your best. Dimensions are so important in the design world. In dealing with overseas suppliers it becomes even more important to clearly communicate dimensions before starting a project. A few years ago I worked on a industrial design via email. Everything looked perfect on screen and it was approved to be sent the physical sample. To my surprise the sample was about 50% the size it should have been. Needless to say, the project was scrapped. In graphic design it is endlessly stressed that designs for print require 300DPI resolution images and for the web they can be reduced to 72DPI. 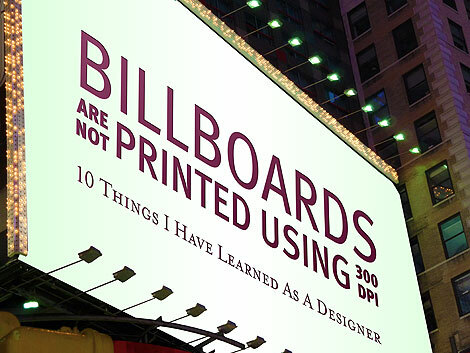 Taking the theory about 300DPI for print early on in my career I applied that to billboard design. After creating a monster file that was 500MB or larger, crashing my computer, and losing half my design to find I had to start over, I realized something was wrong. Then I thought about it. The billboard will be seen from many meters away. So even at a smaller resolution the printing will look crisp. Billboards can go down to 30DPI. Now my computer will not crash. Why didn't they teach that in design school? If there is something that seems wrong with your design but you can not pinpoint it, turn your layout upside down. This forces you to look at your design so you can not read it and you can focus on the composition. This has saved me many times. Good designs look balanced right side up and upside down. Creatives - what have you learned about design?